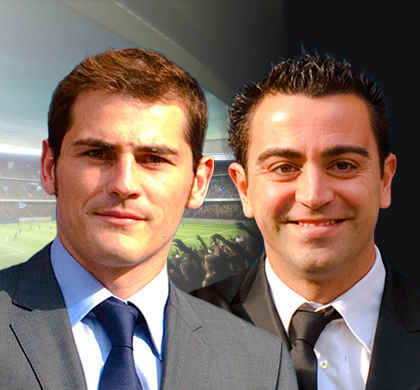 The soccer players Iker Casillas and Xavier Hernández have been bestowed with the 2012 Prize Prince of Asturias for Sport, as made public today in Oviedo by the Jury responsible for conferring said Award. The Jury for this Award -convened by the Prince of Asturias Foundation- was chaired by Arancha Sánchez-Vicario Santacana and composed of José María Abad Casamayor, José Antonio Abellán Hernández, Óscar Campillo Madrigal, Miguel Carballeda Piñeiro, Marisol Casado Estupiñán, Josep María Casanovas i Punti, Enrique Castro Quini, Ignacio Gómez-Acebo del Solar, Juan Carlos González Xuancar, María del Carmen Izquierdo Vergara, Laura Martínez Martín, Javier Muñoz Gallego, Santiago Nolla Zayas, Ángel Rodríguez Berriguete, María Rodríguez Escario, Juan Antonio Samaranch Salisachs, Josep Lluis Vilaseca i Guasch and Ignacio Martínez García (acting as secretary). This candidature was proposed by Joseph S. Blatter, president of the International Federation of Association Football (FIFA). Iker Casillas Fernández (Madrid, 1981) is the goalkeeper and captain of Real Madrid and the Spanish football squad. Forged in the Madrid club's youth teams from the under-10s onward, he joined the first team in the 1999-2000 season. Considered the best goalkeeper in the world, he has won five league titles with his club (2001, 2003, 2007, 2008 and 2012), one Spanish King's Cup (2011), three Spanish Super Cups (2001, 2003 and 2008), one European Super Cup (2002), two Intercontinental Cups (1998 and 2002) and two UEFA Champions Leagues (2000 and 2002). Two time European Champion (2008 and 2012) and World Champion (2010) with the Spanish team, he has also won several titles with the Spanish youth teams, such as the Under-16s European Cup (1997) and the Under-20s World Cup (1999). He has likewise received the trophy for world's best goalkeeper from the International Federation of Football History and Statistics (2008, 2009, 2010 and 2011), the Golden Glove for world's best goalkeeper (2010) and was included in FIFA's Ideal Team in 2010. Committed to helping the needy, he has created the Iker Casillas Foundation to promote and develop activities that contribute to improving the health and quality of life of children and to promoting gender equality. He is Goodwill Ambassador for the United Nations Development Programme (UNDP) and collaborates in solidarity campaigns of other organisations such as Plan International. Among other distinctions, he has received the Gold Medal for Sporting Merit (2010). Xavier Hernández Creus (Terrassa, 1980) is midfielder for FC Barcelona and the Spanish football squad. He played in Barça's first team in 1998, having come up through the youth teams. Considered the brain and playmaker of the team, he has won six Spanish league titles (1999, 2005, 2006, 2009, 2010 and 2011), three UEFA Champions League titles (2006, 2009 and 2011), two Spanish King's Cups (2009 and 2012), five Spanish Super Cups (2006, 2007, 2010, 2011 and 2012), two European Super Cups (2010 and 2012) and two World Cups (2010 and 2012). With the Spanish team, he won the Under-20s World Cup (1999), bronze medal in the Under-21s European Cup (2000) and silver medal at the Sydney Olympics, before debuting that year with the Spain's National Football Team, with which he has added two European Cups (2008 and 2012) and a World Cup (2010) to his list of achievements. Awarded Best Game Builder by the International Federation of Football History and Statistics on three occasions (2008, 2009 and 2010), he has also been named best midfielder by the international players' union (FIFPro) and was included in the UEFA and FIFA Ideal Teams in 2008. He has received the Gold Medal for Sporting Merit (2010), the Medal of Honour of Terrassa (2010) and the Prince Felipe Award at the Spanish National Sports Awards (2010). According to the Statutes of the Foundation, the Prince of Asturias Awards aim "to reward the scientific, technical, cultural, social and humanistic work performed at an international level by individuals, institutions or groups of individuals or institutions". As part of this spirit, the Prince of Asturias Award for Sports shall be conferred on those "whose efforts throughout their exemplary career have contributed in an extraordinary manner to perfecting, cultivating, fostering or disseminating sports". The Regulations establish that the following may present nominations for the different Prince of Asturias Award categories: award winners from previous editions, those personalities and institutions invited to do so by the Foundation, Spanish embassies, diplomatic missions in Spain, the members of the eight juries, provided they do not submit nominations for the Award in the category corresponding to the Jury of which they are a member, and other personalities and institutions of renown. This year a total of 21 candidatures from Belgium, Brazil, China, Germany, Italy, Kenya, Norway, Sierra Leone, Slovenia, Sweden, United States and Spain ran for the award. This is the seventh of eight Prince of Asturias Awards to be bestowed this year for the thirty second time. The Prince of Asturias Award for the Arts went to Spanish architect Rafael Moneo, the Prince of Asturias Award for Social Sciences was given to American philosopher Martha C. Nussbaum, the Prince of Asturias Award for Communication and Humanities went to Japanese video game designer Shigeru Miyamoto, the Prince of Asturias Award for Technical and Scientific Research was jointly bestowed on British biologist Sir Gregory Winter and American pathologist Richard A. Lerner, the Prince of Asturias Award for Literature was given to American writer Philip Roth and the Prince of Asturias Award went to The International Red Cross and Red Crescent Movement. The Prince of Asturias Award for Concord will be announced next 12th September. Each Prince of Asturias Award comprises a Joan Miró sculpture, representing and symbolising the Awards, a cash prize of 50,000 euros, a diploma and an insignia. The awards will be presented in the autumn in Oviedo at a grand ceremony chaired by H.R.H. the Prince of Asturias.